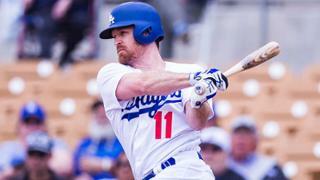 Logan Forsythe drove in two runs and Bobby Wilson hit a two-run home run in the Dodgers’ 6-13 victory over the Diamondbacks at Camelback Ranch. Scott Van Slyke and Yasmani Grandal also drove in two runs during Friday’s game. Scott Van Slyke drove in the first run for the Dodgers with a sacrafice fly in the second inning, then after Enrique Hernández walked, Forsythe hit a single that drove in two runs. The next batter was Yasmani Granda, who hit a single that drove in one more run. In the top of the fourth inning, the D-backs chased Dodgers’ starter Trevor Oaks for three runs. Reymond Fuentes hit a solo home run, then Nick Ahmed and Sergio Alcantara hit RBI singles, tying the game at four. The Dodgers responded in the bottom of the frame with three runs of their own. Van Slyke scored on a wild pitch by Kevin Jepsen, then Grandal hit an RBI groundout and Justin Turner hit an RBI ground-rule double. The Dodgers continued to tack on more runs in the bottom of the fifth inning. Adrian Gonzalez scored on a wild pitch by Diamondback’s reliever Marlon Arias. Van Slyke then hit an RBI single and Bobby Wilson hit a two-run homer, giving the Dodgers a 4-11 lead. In the bottom of the eighth inning, Bobby Wilson scored on the Diamondback’s third wild pitch of the game. Ike Davis then grounded out, driving in Mike Ahmed. Rich Hill gets the start for the Dodgers on Saturday against the Athletics at Camelback Ranch. Hill is hoping that he fixed the kinks in his mechanics when he pitched a backfield game a few days ago. The game against the A’s will start at 1:05 pm PT.